The 2015 horse racing season got underway yesterday at the Marsa Racetrack. The programme featured eight races, all for trotters on a short distance of 2,140 metres. Swedish P.A. Surprise, under the guidance of owner Lorraine Cunningham, won the Premier Class race, the highlight of yesterday’s meeting. Thirteen trotters lined up for the Premier race. Swedish newcomer Lazer Crown (Rodney Gatt) was the fastest trotter in the initial stages, opening a slight lead from Ourasi Diams (Anthony Fenech) and P.A. Surprise. With a lap to go, Lazer Crown was still going strong only to run out of steam midway through the final straight. It was overtaken by three horses with P.A. Surprise securing its first win of the year by half length from Ourasi Diams and Wiss Roadrunner (Mario Farrugia). The winner clocked an average time of 1.16.8” per kilometre. The other races on yesterday’s card were reserved for Gold, Silver, Bronze and Copper trotters. In the Gold Class event, Lover Roc obtained its second win in a row. Driven by co-owner Jurgen Attard, this Italian trotter upped its pace with a lap to go and was unchallenged in the final metres. Quel Imprevu (Carmelo Micallef) finished second from Mont Cenis Honey (Noel Baldacchino). Quazoumax (Andrew Farrugia) and Carnegie Hall (Mario Fenech) tied for fourth place. In the first Silver Class race, Neo De Mira (George Muscat) dashed strongly from the outside with 300 metres remaining. This French 14-year-old trotter went in front midway through the final straight and passed the post first by half-length from Ramses De Tyrole (Anton Cassar) and Titus Du Rib (Andrew Farrugia). Seigneur Du Dropt (Michael Sultana) was fourth. Swedish debutant Udinese (Clint Vassallo) nosed ahead 200m from the finish line of the second Silver race. 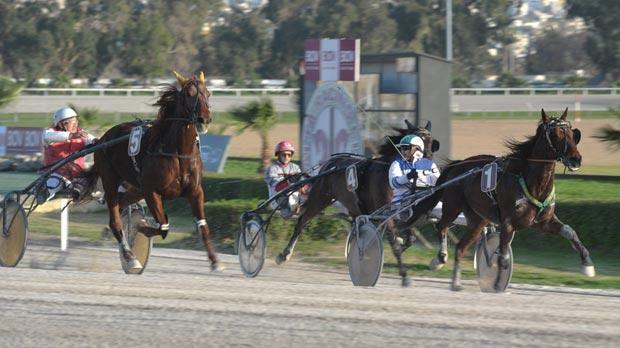 This trotter went on to gain its first win in Malta by a length from Quio De Nappes (Julian Farrugia). Quent De Combourg (Baldacchino) and another French newcomer, Ramses De Mellerey (Joe Schembri) claimed the other top-four positions. Meanwhile, during yesterday’s meeting Charles Camilleri and Kurt Saliba were presented with trophies after being named as champion driver and best Under-25 driver for 2014 respectively. Michael Sultana was also honoured as the best jockey in 2014. Fidel Dalli, on behalf of the Malta Racing Club (MRC), handed out a commemorative plaque to the owners of French trotter Uranium Des Arkads and flat horse Ollie Fliptrik, the two most consistent horses last year. Race 1: Copper, Siderant (Ivan Stivala) – 1.18.7”. Race 2: Bronze, Niko De Chamant (Victor Fenech) – 1.18”. Race 3: Silver, Neo De Mira (George Muscat) – 1.17.6”. Race 4: Gold, Lover Roc (Jurgen Attard) – 1.16.1”. Race 5: Bronze, Pittacos (Noel Baldacchino) – 1.18.4”. Race 6: Bronze, Andri Boko (Tony Demanuele) – 1.17.6”. Race 7: Premier, P.A. Surprise (Lorraine Cunningham) – 1.16.8”. Race 8: Silver, Udinese (Clint Vassallo) – 1.16.2”.